Internet Based "Live Video Security Systems"
Watch live video from the internet and be able to record too. Burglar Alarm: Automatic Notification by pager, email or alarm – When you are away and are not expecting any movement, set it to automatically notify you whenever there is any motion detected. The system can notify you by pager, it can also send you an email including an image of the intruder and it can even set an audible alarm. Live Remote Monitoring – With our surveillance, motion detection, tracking, and remote control features, the Remote Control System can monitor an entire room by detecting, tracking and recording movement. From anywhere in the world, use your web browser to view a history/recording of the movement captured by your Remote Control System! The advantage of using our equipment is that it allows our video conferencing software to automatically keep its subject in the picture as the subject moves around. It also lets your video conferencing software transmit only the subject's image rather than the whole image. This results in higher frame rates and smoother video at the receiving end. 1. The Video/Audio streaming software of your choice must be installed first. This choice will depend on the software used by the people you wish to communicate with. Microsoft®'s NetMeeting, Webcamnow's BroadcasterTM, iNetCam's iVistaTM, Surveyor WebCam, Camarades WebCam, EarthCamTVTM, TeVeoTM, and other video streamers are known to work with our Software 1.6. 2. The Capture driver must be installed in order for your video streamer to take advantage of the tracking feature. 3. The systems Capture video source must be selected in your video streamer. What Do these Functions Give You? Freedom – With our person-tracking feature, you will no longer be confined to a fixed spot when video conferencing with your family, friends, and business associates. The Remote Control System automatically pans and tilts to keep you centered in the picture as you move around. Flexibility – The Remote Control System's ultra-wide range of movement lets your camera point anywhere instantly without clumsy manual positioning or propping. With our point-and-click positioning feature, you can center subjects in the picture just by clicking on them. Or, with our mouse-tracking feature, you can pan and tilt anywhere by simply dragging your mouse around. Improved Video-Conferencing – Using our specially designed software, we can help you get rid of the choppy, broken images normally associated with current video conferencing software. Ease of Use – Our well-designed user interface lets you track movement, record videos, capture and upload regular or panoramic images with a simple click of a mouse or voice commands! Compatibility – The Remote Control System works with your standard USB pc-cam (such as Logitech QuickCam® or Creative® WebCam) and is compatible with whatever video conferencing software you are currently using. If you’ve ever visited a website and saw one of those remote control (pan, tilt, rotate, zoom) webcams and felt you were still in the 20th century, you’ll love 321cam’s remote control cameras because if provides an affordable way for you to add your own security system at home or work. Just like the extremely high end closed circuit TV systems that you see in fortune 500 and even Las Vegas casinos, the remote control camera allow you to not only duplicate the same features but they have even more. 321Cam’s products allow live monitoring, recording for later playback, pan/tilt/rotate/zoom the camera locally and also via the internet, playback the recording locally or even remotely using the internet, view the video from your cell phone, voice activation, automatic tracking of movement, password protection and the list goes on and on. What can the system do? 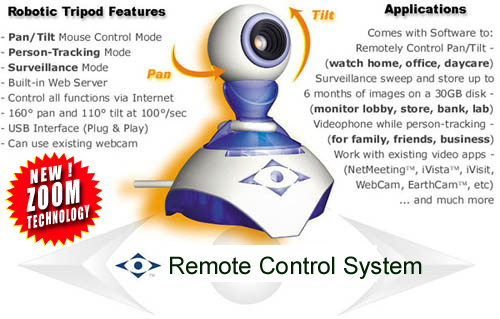 It is a Remote Control Video System - A small robotic tripod on which you mount a webcam or digital camcorder. In includes Artificial Intelligence software to control camera movement from your computer. Together they perform the function of a robotic camera-man for your webcam. With the system installed, your camera comes robotically alive, panning, tilting, and zooming under your computer's control. Watch 120 to 170 live webcams right now (all family friendly). Put a Passcode/Password on your video so only those that know it can view it. List your camera on our website or not. Record 24 hours a day. Watch your recording from any other computer connected to the internet. Talk using a microphone and our BuddyTalk option. Broadcast from a Webcam OR Camcorder. Control up to 4 cameras with 1 computer. Connect directly to the actual camera software from the internet using a remote PC. Choose to have your camera up to 300 feet away from your PC. Digital zoom from 50% to 300% using an ordinary pc-cam. Watch it from your cell phone.